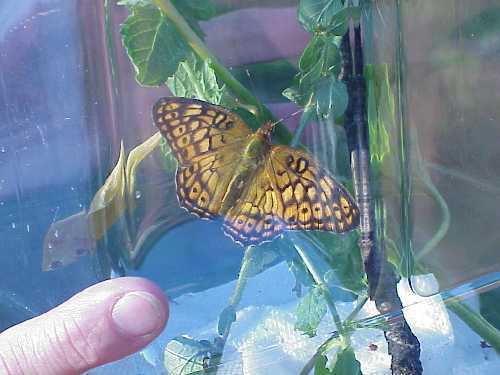 It had been a great summer for learning about butterflies. 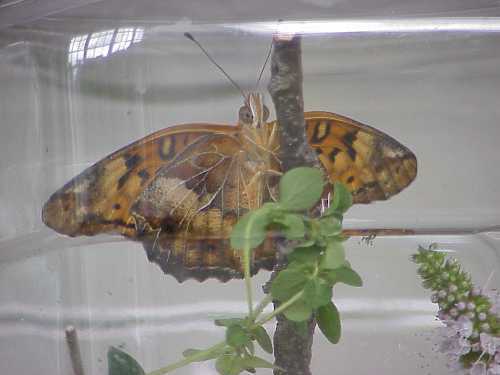 My friend Marj had discovered some nice butterfly habitats, and my "life list" now included nine species of the elegant little Hairstreaks and three species of the larger orange-and-black Fritillaries, as well as many others. At the end of July I went to Iowa to visit family. 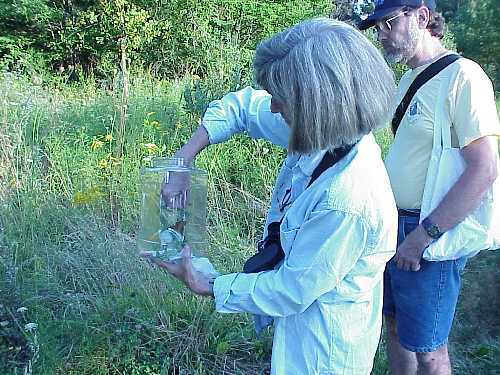 Cedar Rapids, Iowa, has a series of nature trails along the Cedar River and Indian Creek. Knowing my interest in birds and butterflies, my mother suggested that we walk a different section of these trails each nice morning. 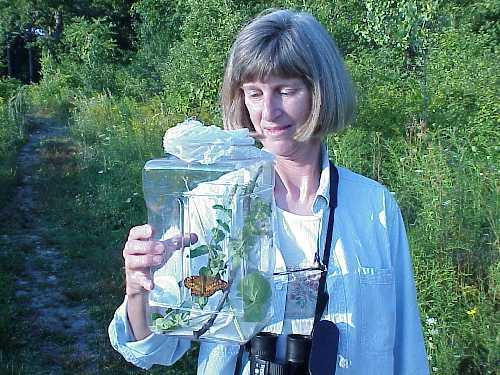 On July 31st we ended our walk at the Nature Center, which had a butterfly garden. 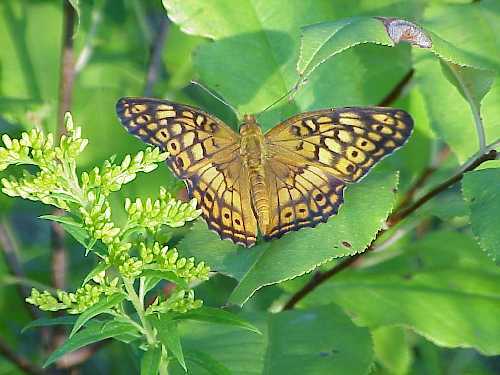 As I wandered down the path, reading the placards and looking at the flowers, I noticed a Variegated Fritillary fluttering near the edge of one path, landing frequently on leaves. 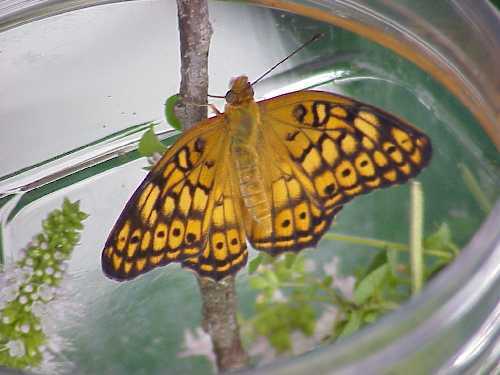 I had recently seen one of these butterflies for the first time in Massachusetts. 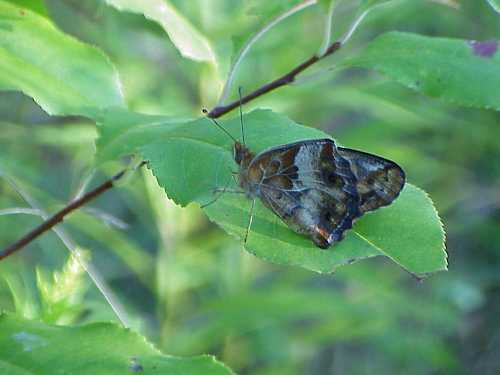 Looking through binoculars, I thought I could see the end of the abdomen bending down to touch the leaf, and it occurred to me that the leaves were violets, and that I had read somewhere that Fritillaries lay individual eggs on violet leaves. How exciting! I'd never seen a butterfly laying eggs. I swooped down to pluck the leaf I thought the butterfly had just left. Yes, there was a yellowish spot on the leaf, which could be an egg. Back in the car I put on my reading glasses and was disappointed to see that the yellow spot was not an egg after all, merely a discoloration on the leaf. But it was my lucky day. Nearer to the stem was a tiny white bump, and under a magnifying glass this little ridged conical shape looked similar to photos I had seen of butterfly eggs. 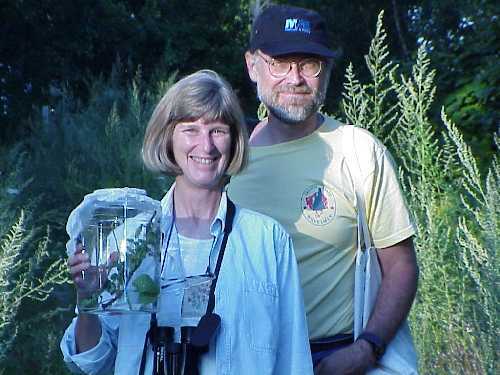 A couple days later I returned home to Massachusetts, carrying the violet leaf with its attached egg in a transparent 35 mm film canister, eager to share my discovery with Marj and with Dave, my significant other. But on August 4th the egg disappeared. Dried up? Fallen off? I checked the cannister and leaf carefully and found the tiniest of little worms. Now this was getting really exciting. I had a caterpillar. 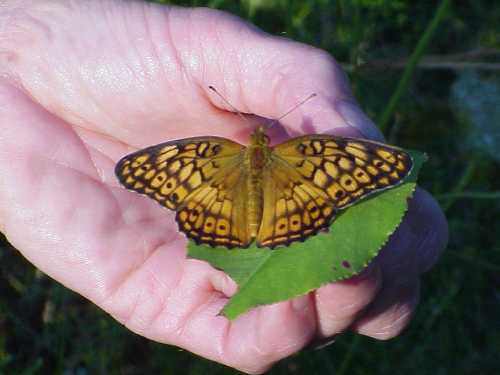 Some research on the Web and in field guides informed me that Variegated Fritillaries in the north have 3 broods between April and October. 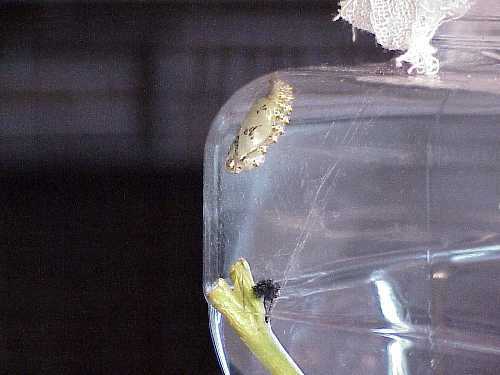 In general, butterfly eggs hatch after 5 days, the caterpillar grows for about 15 days, molting four or five times along the way, finally forming a chrysalis. 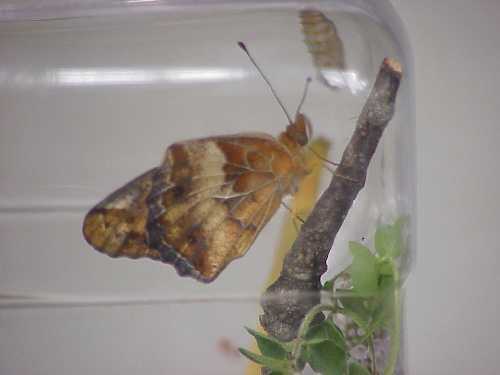 The adult butterfly emerges from the chrysalis about 10 days later. Well, it really works like that. The "worm" munched its way through violet and pansy leaves picked fresh every day or two, molted at least twice that we observed, and grew to be a 1-3/4" dark red caterpillar with black and white stripes and rows of black spines. We discovered that caterpillars sometimes eat their discarded shells when they molt. I also observed an interesting fact about their droppings (frass). 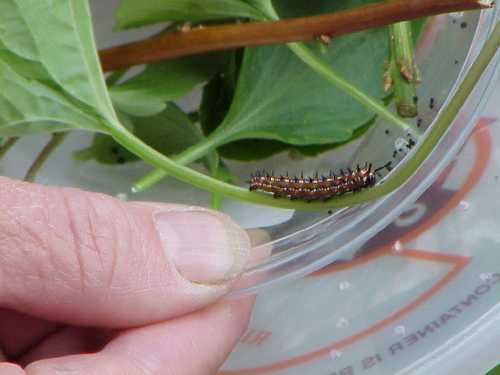 As the caterpillar grew larger, so did the quantity of frass it produced, and I needed to clean out the plastic container (a one-gallon plastic food storage container) about once a day. I was puzzled about how the frass ended up stuck to the top, sides, and bottom of the container, even though the caterpillar seemed to move about very little, usually staying on the leaf it was eating. One evening I was cleaning out the container, and the caterpillar, which we now called Fritz, was out on the kitchen counter beside me, chewing on a leaf. Slowly it raised its rear end, and then ping! - a little pellet hit me in the chest. "Dropping" is clearly a misnomer. On August 19th, Fritz the caterpillar stopped eating and spent the day in an upper corner of the plastic container, making a web of silky threads across the corner. It also seemed to be shrinking in length. Finally it attached its rear end to the top of the container and hung suspended with its front end slightly curled. By the next day (August 20th) it had become a bluish-green chrysalis with delicate black markings and shiny irridescent gold bumps. 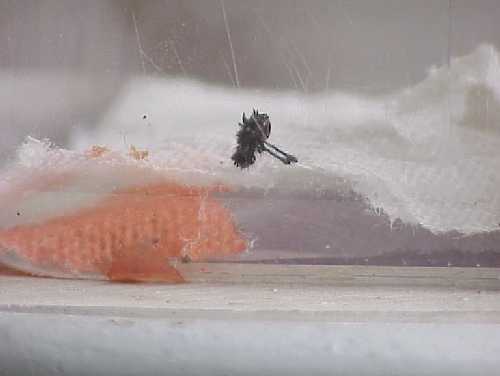 Its discarded head capsule with two long spines still attached had fallen into the web. Now the final wait. 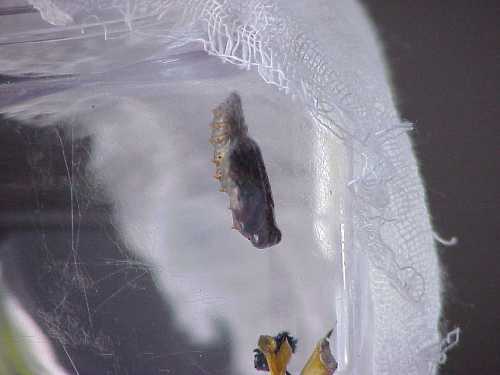 On the morning of August 28th, the chrysalis began to turn dark brown, and soon was completely brown. A couple times it twitched back and forth. I went off for my morning walk, assuming that this process would take hours, maybe even days. I blew it! 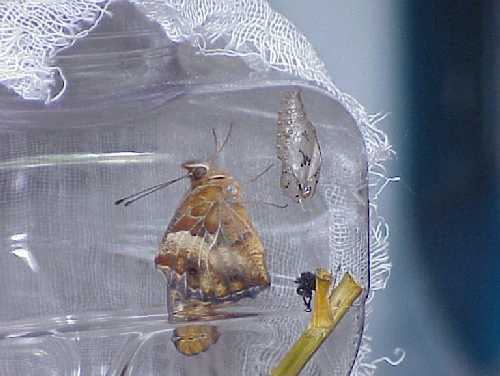 When I returned an hour and a half later there was a butterfly hanging from the webbing beside the empty chrysalis. A reddish puddle on the bottom of the container suggested a violent birth. And I had missed it. But Fritz was a beautiful butterfly. 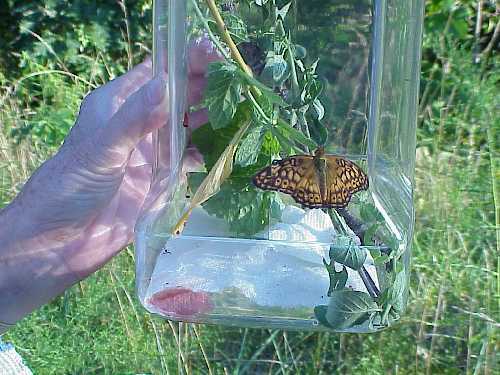 Within a few hours it was fluttering about the container, trying to get out. 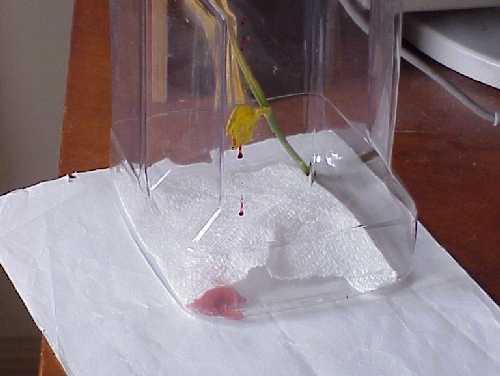 I added a few flowers and a sugar-water-soaked piece of paper towel, but didn't see any nectaring behavior. 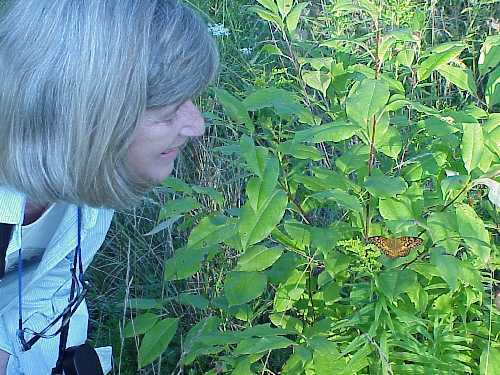 That evening (many photos later) Marj, Dave, and I decided to release the butterfly at a place in Woburn where we had seen another Variegated Fritillary earlier in the summer. 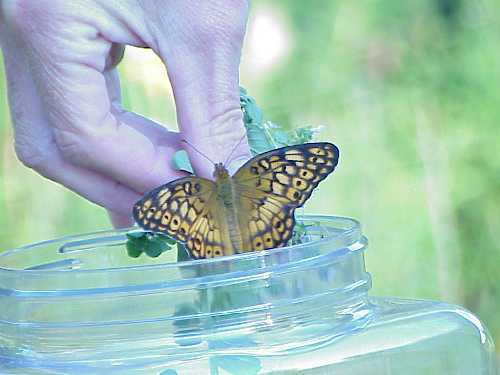 With a little encouragement, Fritz flew out of the container, settled on a nearby leaf for a few final pictures, and then finally took off into a field of flowers. 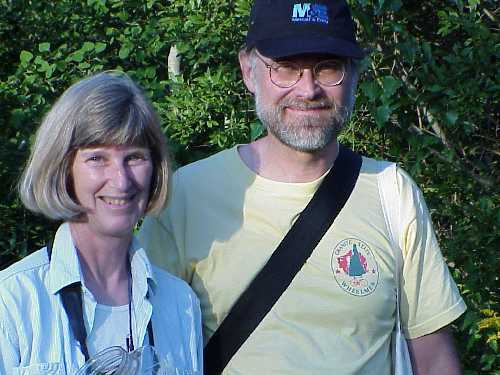 -Many thanks to Marj for being the official photographer and for setting up this web page.